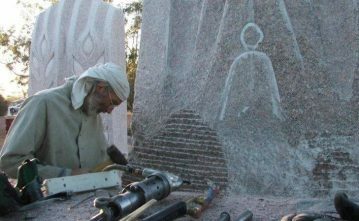 Watch the masters at work as two well-known Australian sculptors create iconic art work before your eyes on the Port Lincoln Foreshore from two 1.5 tonne Granite blocks through the SALT Festival. Sculptors Marijan Bekic and Silvio Apponyi, will create two inspired works and completed work is displayed as part of the Images of SA Exhibition at the Nautilus Theatre Rotary Gallery. Both events have been organised by Terry Krieg. Silvio Apponyi migrated to Australia during Infancy, already confident with wood carving from the age of seven. Apponyi went on to study sculpture at the North Adelaide School of Art and during that time, he won a German Academic Exchange Scholarship (DAAD); where he studied for a year at the Munich Academy. Since then he has had one-man shows and group exhibitions locally, interstate and overseas. He has won several prizes, accepted commissions, conducted workshops in Australia and Malaysia, and studied wood-block printmaking under a Japanese master. His work is featured in many private collections both here and overseas and in public spaces across Australia. Marijan Bekic was born in Bosnia-Herzegovina and moved around central Europe finally achieving his ambition of a formal degree in arts and sculpting in Berne. He settled in Australia in 1969 and has a studio at Wudinna SA. He is best known for the giant granite sculpture the Australian farmer in Wudinna. The Australian Farmer (also known as the Big Farmer) is a statue located in Wudinna, South Australia. Regarded as one of Australia’s Big Things, the granite sculpture stands at 8 metres (26 ft) in height, and weighs in the vicinity of 70 tonnes. It took 17 years to produce from initial proposal to the final unveiling in 2009, and two years for the artist, Marijan Bekic (with the assistance of his son, David), to carve. The stylised work of a farmer represents the early settlers of the region, with carvings symbolising grain and sheep found within the sculpture. Silvio and Marijan welcome the public to view their works in progress throughout the SALT Festival.